Flynn creates a new Electronic World and transfers Tron into it to act as its protector. He also creates a new Clu to guide the new world into becoming a perfect system. Betrayal is a prequel to Legacy and takes place shortly after the events of Tron, about 25 years before Legacy. Although he doesn't look much like Bruce Boxleitner, the cover is a portrayal of Tron slinging his identity disc, as identified by the T-shaped series of lights on his chest. As the story opens, Flynn and Tron are riding a newer version of light cycles from those seen in Tron (and also different from those seen in the alternate timeline stories of Tron 2.0 and Ghost in the Machine). They are being chased by what appear to be grid bugs of a different design as well and the bugs are seen to derezz the firmament of the Electronic World around them. As Flynn and Tron flee the grid bugs, they appear to be able to drive their light cycles straight up the side of a building on pages 5-8. 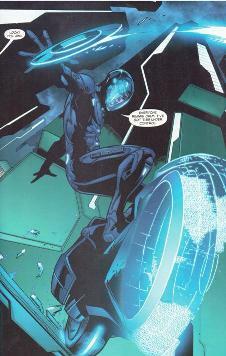 On page 9, panel 1, Tron's light cycle helmet retracts back into his armor to expose his head. This feature of the helmets continues to be shown in Legacy as well. 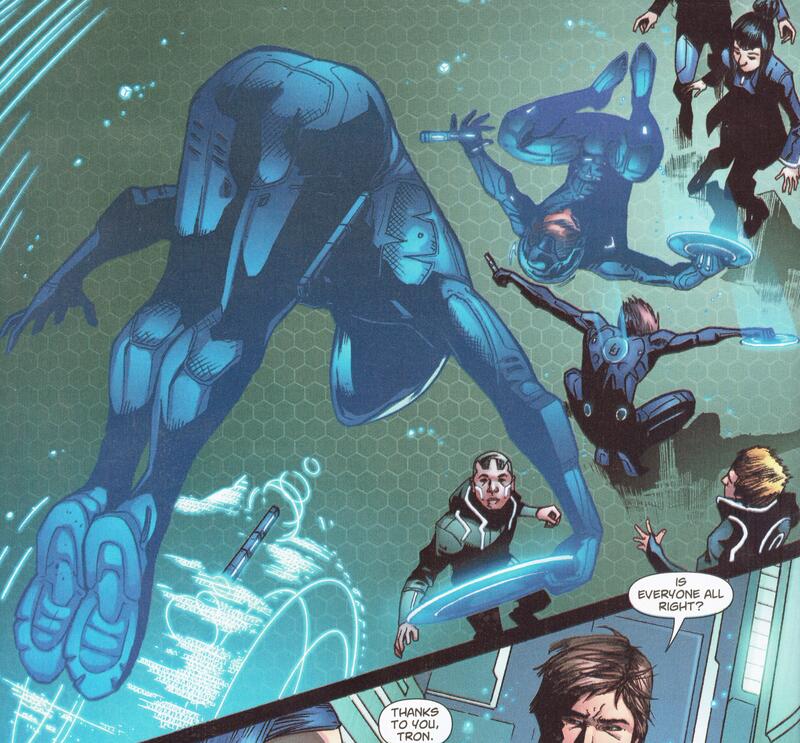 As he stops and leans up from his cycle, we can see on page 9 that Tron, though he has a new outfit, still has the four T-shaped lights on his chest. The dialog between Flynn and Tron on page 9 indicates that Flynn has built a new system, in other words, a new Electronic World, and he's brought Tron over from the old one as "the best security force a guy could have." Panel 3 of page 10 subtly shows the wedding band on Flynn's left hand, the first indication to the reader that he is now married. The calendar in the doctor's office on page 12 shows us that it is currently April 1983. As Flynn and Jordan have lunch at a sidewalk cafe on page 13, one of the skyscrapers in the distance is identified as the ENCOM building from a small sign at the top. On page 15, Flynn brings up the new CLU program on his computer at the Flynn's Arcade building. The computer appears to be built into the desk itself, with the multiple screens displaying on the horizontal desk top. Possibly this is the same desk-computer formerly used by Dillinger in Tron. The text seen on his screen here is basically unreadable without magnification and turns out to be mostly just a jumble of numbers and letters (some of them backward!) to give the impression of lots of jargon associated with the program. The top right screen on Flynn's horizontal desktop shows Clu's face and a few legitimate lines of text, though nothing particularly interesting. Page 20 seems to indicate that Tron draws huge crowds of denizens at the game grid stadium, Flynn's "cultural center" in the new world. Page 27 introduces the first self-generated life form in the new world, what Flynn describes as an "isomorphic algorithm", "iso" for short. The first of these isos seen here is female and names herself Ophelia. Isos seem to be identifiable from user-created programs by glowing marks on their faces (though in Legacy the isos do not seem to have such telltales). The ENCOM board meeting on page 29 tells us that ENCOM has branches and interests all over the world (Tokyo, Reykjavik, Manila, Amsterdam, Mumbai). On page 30 we see that in Flynn's ENCOM office, there are a couple piles of computer towers, monitors, and peripherals around his desk and walls. Not sure why they would be sitting there cluttering up the office of the CEO, but it may be an indication that Flynn is constantly swapping out his desktop computer for the latest model. I guess he also didn't want to pay for another "Dillinger Desktop" for the office! On the back wall of Flynn's ENCOM office is a large TRON sign. It looks basically just like the movie and arcade game logo. Within the context of the Tron universe, it must represent the logo of the Tron arcade game designed by Flynn, as seen in Legacy (presumably still designed after his adventure depicted in Tron if the storyline told in Tron 2.0 is to be believed; though Tron 2.0 and Ghost in the Machine are effectively negated by the canonical events of Tron: Legacy and its spin-offs, many of the trappings of Tron 2.0 have endured). Flynn has given Tron the task of keeping the residents of his new world safe. Pages 32-34 depict Tron, with his throw-and-return identity disc and light cycle, as an almost Captain America type super-hero! 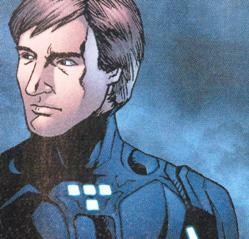 Amusingly, Flynn has his shirt tag sticking up above his t-shirt collar in panel 2 of page 38. Flynn builds a special phone for his wife, Jordan, on which to call him during her pregnancy. She's asleep when he first goes to present it to her, so he leaves a note taped to it (page 41) that tells her to dial a number sequence to reach him. The last digit is obscured, but the number appears to be 709-1982. This translates into the release date of the original Tron movie, July 9, 1982 (7-9-1982). On page 43, Flynn is riding a beam on some new contraption of his design and, in his excitement and joy, says "yes" over and over. 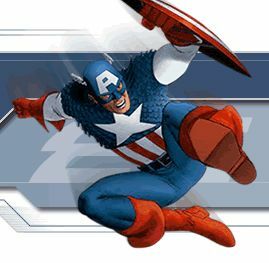 Then something goes wrong and the beam leads his vehicle to smash into the side of a building and he says, "No no no!" This may be a bit of an homage to the Bit seen in Tron, which could speak only in the positive or negative, and frequently repeated "yes yes yes" or "no no no". On page 45, the denizens of the new world refer to Flynn reverently as "The Creator". On page 47, the two guard programs in the background have a dash of red glow on their armor. This may be an indication of a darker presence manifesting in the new world, a la the red glow of Sark and the other minions of the MCP (probably related to Clu's growing feeling of abandonment of he and his world by his creator). On page 48, Clu refers to the "real world" as Flynn's Olympus. This is a reference to the Greek mountain called Olympus, believed by the ancient Greeks to be the home of the Olympians, the twelve gods. Clu believes that the existence of the isos is causing problems in the system. He says to Flynn, "How can we have the perfect system if you did not make them?" to which Flynn replies, "That's the sixty-four thousand dollar question, isn't it?" This is a reference to The $64,000 Question, an American game show which ran from 1955-1958. The show's title has entered the American vernacular as any perplexing or significant question. It is interesting to note that Clu does not get the reference to The $64,000 Question or, earlier in his existence, the concept of "day", nor, later, does he even know what a baby is, but he is aware of the mythological significance of Olympus. How did he learn of it? It would seem he has been studying the concept of worshippers and the worshipped. On page 52, Clu comments that Flynn made him "in his image". This is a reference to the Genesis chapter of the Old Testament, in which it is stated that God created man in His image. The last two pages of the issue suggest that Flynn's wife is named Jordan Canas and that she is still using Canas as her last name. So, did she simply choose to keep her maiden name in marriage? Or are they not actually married, despite what seems to be a wedding band on Flynn's finger?